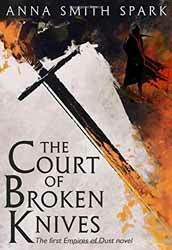 The Court of Broken Knives is book one of the Empires of Dust series of novels, written by Anna Smith Spark. The story is told from multiple perspectives and two different time frames, with the past gradually illuminating Marith’s backstory. It’s been a long time since I have read a fantasy novel which introduced its reader to a whole new story. Spark has been able to create a vibrant new world for her audience without relying on over used tropes of the genre. So, thank god, we do not have the old ‘child born in poverty finding his power and completing a destiny plot’, or should I say there is a little of this but it’s a very twisted version. There is some magic and even a dragon or two, but like George RR Martin’s work these are background elements which are subsumed to the human drama which unfolds. Spark has also taken the brave decision to make pretty much every character a complex mix of good and bad and as such there is not a single hero for the audience to root for, only protagonists trying to stay alive. These are complex creations with understandable, if often twisted, goals. The nearest thing to a hero is Marith, the youngest and strangest of the band of mercenaries. From the beginning of the book it’s clear that all is not right with him. Even when his full history is drip fed to the reader, he only ends up more of an antihero. The internal working of Solost is viewed from the perspective of Thaia, the high priestess of the temple, whose main function is to perform the sacred ritual, a lot of which involve the murder of children. We also have Orhan, a nobleman and the instigator of the plot against the emperor’s life. He feels that regardless of the wealth of the city and it does seem insanely rich, that its decadence is proof of its weakness. What I really like was that Spark has written an intense political drama, very much in the mould of Game of Thrones, in a world which is both beautiful and deadly. She has a keen eye on the complexities of humans and the devils and angels which vie for their souls. There is also a good range of fully fleshed ancillary characters, most of whom contribute to the plot's large body count. This is very much an adult novel and while there is love there is also a lot of lust and drinking. All these elements fit perfectly into the world that has been created and I never felt that their inclusion was gratuitous, in many case it served to explore the complex nature of relationships. In creating the book Spark has raised the game for the genre with her darkly gritty tale where it is the journey which counts and your ability to survive the ride.